The enamel of the primary dentition undergoes development from approximately the 13th week of gestation to around 3 years of age when the second primary molars erupt into the oral cavity. During this period, the developing primary dentition can be affected by many systemic and local environment insults that lead to changes in the quality and quantity of the enamel. The systemic influences that can cause abnormalities in the primary enamel range from pregnancy conditions such as pre-eclampsia to neonatal disruptions such as preterm births and postnatal infections such as rubella and chickenpox. 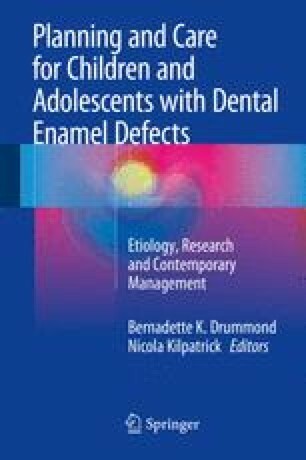 The prevalence of enamel defects has been reported to range from approximately 30 % in the general population in USA, Britain, and Australia to over 70 % in preterm children and indigenous populations worldwide. The high prevalence of enamel hypoplasia reflects the vulnerability of developing teeth to environmental changes and suggests that complications of enamel defects, such as increased caries susceptibility, are common in the primary dentition.